A Pacific Northwest icon, Puget Sound is the second-largest estuary in the United States. Its unique geology, climate, and nutrient-rich waters produce and sustain biologically productive coastal habitats. These same natural characteristics also contribute to a high quality of life that has led to growth in human population and urbanization. This growth has played a role in degrading the Sound, including declines in fish and wildlife populations, water-quality issues, and changes in coastal habitats. Natural resource managers look to the USGS as a critical science resource needed to solve problems in this important ecosystem. Elliott Bay, Seattle. Population growth and urbanization have changed the nearshore habitat. The deterioration of the Puget Sound nearshore is of special concern – the area from the high-tide shorelines out to where sunlight does not reach the bottom, and upstream in estuaries to the head of tidal influence. It includes bluffs, beaches, mudflats, kelp and eelgrass beds, salt marshes, gravel spits, and estuaries. Because the nearshore is one of the most productive parts of the Sound, improved understanding of it is vital to restoration and preservation of the entire Sound. To develop a restoration program, Federal, State, Tribal, and local governments; NGOs; universities; and private industry joined in 2001 to create the Puget Sound Nearshore Ecosystem Restoration Project (PSNERP). In December 2005, protection and restoration of Puget Sound was expanded in scope with the creation of the Puget Sound Partnership. As a task force within the Governor of Washington’s Puget Sound Initiative, the Puget Sound Partnership’s goal is to develop recommendations to restore the Sound by 2020. Diagram of the nearshore. Courtesy of King County Department of Natural Resources. The primary focus within these themes is on developing information on the physical, chemical, and biological processes—as well as human dimensions—associated with the restoration or rehabilitation of the nearshore environment. Puget Sound partners and citizens will receive USGS results through databases, geospatial models and analyses, technical reports, and formal publications. As the Puget Sound Partnership expands the scope of Puget Sound problem-solving, USGS—through CHIPS—stands ready to provide the necessary scientific foundation for decisionmakers. Urban development can alter the complex interaction of geological, biological, and hydrological processes that maintain nearshore ecosystem health. Urbanization is known to alter the flows of water, sediments, nutrients, and contaminants from coastal watersheds, which then may impact nearby nearshore ecosystems. In addition, human alterations adjacent to the shore, such as armoring and removal of riparian vegetation, may impact nearshore ecosystems even in areas far removed from population centers. Effective restoration of impacted nearshore processes within Puget Sound requires an understanding of how ecosystems function in a variety of nearshore settings with and without urban impacts. Current work is focused on quantifying the processes that influence physical and chemical aspects of nearshore habitat and how these affect general nearshore ecosystem health. Ecosystem health will be measured by indicator variables including population structure, growth, reproduction, and survival of native species; presence and abundance of exotic and invasive species; and the presence and distribution of contaminants in sediments and indicator species. Geospatial measures will be developed to better define watershed urbanization and shoreline modifications that impact nearshore ecosystem health. 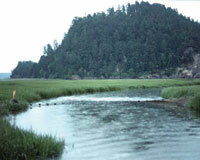 Estuaries like the Skagit River delta are used by many species of fish and wildlife throughout their life cycle. Deltas serve many ecological purposes, including estuarine habitats for fish and wildlife. But during the past 150 years, 70 to 80 percent of the marshes and wetlands of Puget Sound have been lost. These changes reflect human impacts associated with a variety of agricultural and residential activities that have ultimately altered streamflows, transport of coastal sediments, water quality, and a myriad of other processes that are responsible for habitat creation, maintenance, and biological productivity. In the Skagit River delta, activities such as damming, diking, land clearing, draining, deforestation, and agriculture have caused significant changes in lowland habitat. In addition to habitat losses, existing margins of the coastline have lost their connections to other areas through ecosystem fragmentation created by physical barriers and altered tidal flows. Current work is centered on the ecology of eel grass beds and other coastal and wetland habitats. Investigators are compiling and evaluating historical information and collecting baseline data about sediment transport and other hydrographic processes to help characterize the physical and biological environments of the Whidbey Basin nearshore. The importance of coastal habitats to endangered Chinook salmon and bull trout are a special focus of biological study. USGS scientists examine the Elwha River bed to monitor the biological effects of dam removal. The Elwha River drains the largest basin in Olympic National Park and has huge potential for salmon recovery in the Puget Sound region. For more than 90 years, the natural flow of the Elwha River has been altered by the presence of two dams. These dams have interrupted the normal flow of sediment and debris to the shore and prevented anadromous salmon from accessing pristine habitat in the park. The Department of the Interior is planning to remove the dams in 2009 to restore the physical and biological integrity of the river ecosystem. Restoration of the river will be a significant and unprecedented Federal contribution to salmon recovery in the region, but many questions remain about the river’s response to dam removal and the recovery process for salmon. A unique opportunity exists to examine the ecosystem response to the dam removals. Studies of the physical and biological effects of dam removal will be grouped into three general categories: ecosystem responses, flow modification and sediment transport, and cultural resources. Ecosystem processes will be monitored along the river before and after the removal of the dams. 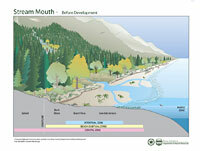 Work under consideration includes mapping of shelf, nearshore, and beaches as well as salmon habitat; monitoring of coastal processes; and river sediment and nearshore computer modeling. For more information about USGS activities in Washington, visit the USGS Washington Water Science Center home page.